Hostel & Suites del Rio i Colonia del Sacramento, Uruguay: Bestill nå! Hot water 24 hours uninterrupted, thanks to the supply of solar equipment. Breakfast can be served on the terrace in front of the property, in the cafeteria or on the patio. Our guests have a kitchen and grill equipped for your comfort. 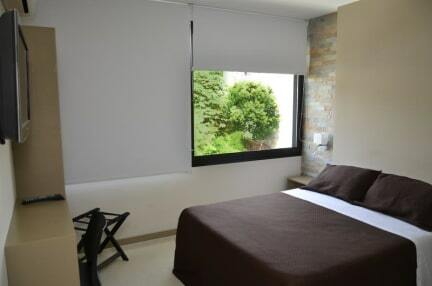 We offer shared rooms with 6 beds equipped with the necessary amenities to make your stay in our magical and unforgettable Colonia del Sacramento is the best, these rooms have air conditioning (cold), heating by hot water radiators, hoods and individual lights for each. Bed, WI-FI in the rooms and in the rest of the establishment. We also have family for 4 people with bathroom outside the room but for exclusive use for their guests and double room with one or two beds and shared bathroom with the rest of the rooms.